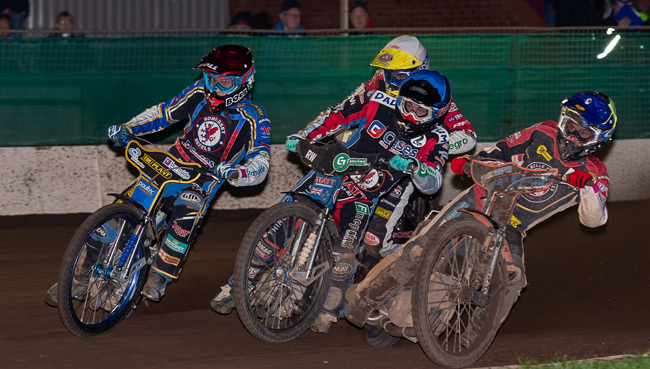 A sublime knockout cup first leg performance from Jake Allen helped the 'Cases' Somerset Rebels compensate for the mid-meeting loss of world number one Jason Doyle through a hip injury, and put the Rebels in a strong position ahead of next week's second leg in Manchester, where they will take a 14 point advantage. Scoring paid 17 from a full seven ride quote, Allen could easily have added to that tally had it not been for a retirement in heat 11 when his bike just wouldn't power him away from the start. Allen was in the middle of a three-in-a-row ride sequence having been drafted in to replace captain Jason Doyle in heat 10 after a spectacular crash saw the reigning world champion Doyle and New Zealand champion Bradley Wilson-Dean tangle in a tight first turn. Whilst Doyle was on his feet before his team-mate, the tough Aussie was left with a thigh injury that forced him to withdraw from the remainder of the meeting, just two completed rides under his belt. Bravely, Wilson-Dean, who had fired the Rebels into an opening heat lead , partnering Doyle to a 5-1 and also produced an incredible heat 8 ride to join Aaron Summers on a maximum heat score, came out for the re-run and was content to pair up with Allen to keep Steve Worrall at bay whilst Rohan Tungate took the honours. It was the second of four shared heats recorded after the Rebels had built an 8-point lead after as many heats. Allen corrected his machine issues in time to replace the time-exceeded Covatti in heat 12 and he and fellow reserve Aaron Summers nearly increased the advantage but Summers was ultimately caught by Worrall for another shared heat. Jack Holder literally "smoked" it in heat 13, his machine bellowing out smoke as oil was leaking on to his exhaust but he managed to get far enough clear of Max Fricke to guarantee the win. Backing up in third was Richard Lawson, as the Aces were handicapped by Craig Cook's starting penalty for failing to be ready to race within the allotted time when his bike stalled at the tapes. Lawson and Allen then bolstered the Rebels advantage with a superb 5-1 in heat 14 before Allen capped a great night's work with victory in the final heat. Promoter Debbie Hancock acknowledged another good Rebels performance admitting "Jake was really on it tonight and that was some performance on what could have been a very tough night for us once Doyley was forced out of the meeting. But the team were even more determined once we went a man down and we have given ourselves a decent lead to work with next Wednesday. But nothing has been won yet. We still have a job to do and right now our main thoughts are on making sure JD and Bradley are fit and raring to go for another big meeting here at the Oaktree on Monday when we host Poole in the play-off semi-finals.